During college I studied abroad for a semester in Paris, France. During this time, I made the most of living in Europe by visiting many countries, but my favorite among them was Belgium. The unique architecture, the cute cafés and squares, the rich history, the beautiful canals and the food were all so inviting. So inviting in fact that 10 years later my husband and I returned. But this time I arrived with a true itinerary in mind that orbited around Belgian beer. The world’s best beer: Westvleteren. As we start planning our trip, we discussed our plans with some friends who had visited Belgium a few times as well as consulting some friends who live in Amsterdam, just a few hours north of Belgium. With so many beers to try to only a few days in the country, we wanted to make the most of our time. We picked Bruges as our hometown for our tour given the easy walking nature of the city paired with impressive beer pubs and close proximity to St. Sixtus Abbey, the primary reason for our pilgrimage. So at the top of our list was a visit to the Abbey of Saint Sixtus. This is home to the best beer in the world, also know as Westvleteren 12. 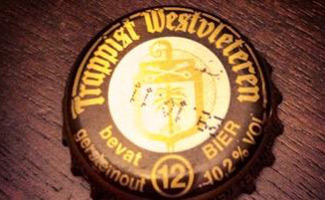 Wesveleteren 12 is a Belgian Trappist Ale that has been voted the top beer in the world for many years running. Founded in 1938 at St. Sixtus Monastery, the Westvleteren Brewery is the only place you can buy this coveted beer today. On December 12, 2012 (12/12/12), the monks generated a great deal of funds to expand their operations by offering a one day/one time distribution of Wesvleteren 12 in limited supply to stores around the world. They sold for $85 USD per 6 pack and sold out within hours of release. It created a lot of buzz and no doubt has increased tourism to this countryside village in western Belgium. We started our drive towards the abbey, passing through the beautiful Belgian countryside. About an hour later, we arrived at a small country road that said “Westvleteren” and seemed to lead to nowhere. However, as we got closer we started seeing more signs of life. Then, out of the blue, there was a parking lot filled with cars and a building that looked more like an American visitor’s center with a fancy restaurant than a centuries-old abbey where monks would be making beer. Despite the touristy nature of the destination, the experience did not disappoint. As we walked into the visitor center/restaurant, our stomachs began to growl as we anticipated the tasty food. But, more importantly, we drooled in anticipation of the great beer we were promised. There were three of us on this tour and three beers to be tried so we each ordered one and got started. There was a blonde topped off with a green cap, an 8 (blue top) and the coveted, Westvleteren 12, the holy Grail of beer. We tasted. We savored. We swapped glasses to taste each and every sip. And to say we enjoyed every sip of this rich caramelly delight that the Belgians call bier would be an understatement. It was truly an experience of a lifetime. Note: Restaurant is closed on Fridays which did not affect us, but do not plan your trip for a Friday as you will be disappointed and there is much else for miles to entertain yourself. After enjoying our lunch and beers, we walked across the street to where the beer pick up happens next to the monastery. We were lucky enough to watch a few cars pick up their crate of beer. You see this is not just a drive through. In fact, you have to call (on the beer phone of course!) months ahead to schedule your appointment to pick up. And, supply is very limited, so they actually limit people to two crates every 60 days (must both be picked up on the same date/time). So if you plan to be in Belgium and want to leave with more than a 12 pack, be sure to call ahead or you will be out of luck. The monks run a pretty tight operation. Beer Ice Cream? Yes Please! As we walked back to our car, we started contemplating dessert. So we went back to the restaurant where we sat out on their back patio to enjoy the relatively warm day (we were in Northern Europe in July after all). When we saw the dessert menu, we were thrilled to have the opportunity to try beer ice cream made with the best beer in the world! It tasted like the most rich wonderful caramel ice cream you could ever imagine with a hint of hops and a lot of deliciousness. We also added our own twist by pouring some hot fudge over the top for a salty-caramel-chocolate-beer mishmash of decadence. Last but not least we visited the gift store where we could purchase a maximum of 12 Westvleteren 12 bottles of beer per person to go and we each proudly bought our dozen. Two dozen Westvleteren 12 beers came home with us back to North Carolina and today they are being cellared for special occasions over the coming years. They can be bottle aged for 5+ years and are known to get better with age. With each bottle we open in the coming years, we plan to relive the wonderful memories of this visit to the monastery and Belgium. What would you do to try the best beer in the world? Hi Michelle, first, thank you for the article. Great information. Two questions for you. I’m planning to visit Bruges in July and thankfully St. Sixtus isn’t far from there. Do you know if they have a tour to there from Bruges and second, how did you get it back to the U.S? I’ve never brought back liquor from a trip. Thank you. Enjoy your trip and keep us posted! Hello there. I am planning to go there next month, but probably will not be able to order in advance to collect, so I am planning to buy without reservation. Do you remember how much you paid for this in their shop? Thanks. Gosh Diego – good question! It’s been awhile but I feel like it was $24 for a six pack but it may have been closer to $20. I did not order in advance either and it was fine. We had 3 people so were allowed to take away 3 six packs. While you are there you MUST drink a beer or three AND have their beer ice cream sundae! The rich Belgian beer makes the ice cream taste sweet like caramel so when you add Belgian chocolate sauce on top, it is heavenly! Oh, Good! I confess probably I wouldn’t go for the ice cream sundae, but the way you describe it makes it impossible to resist! As I probably will be there by car, I think it is not advised to have three W12 with more than 10% alcohol but I believe one should be ok according to Belgian drink and driving laws 🙂 Thanks for all your advice, Michelle! Cheers. This is really an amazing beer but I have tried to order through the beerphone and it was busy all the time. After a few weeks I placed an online order with one of the online shops that I could find on the internet. 6 bottles from westvleterenbeers.com were pricey but at least I had 6 bottles to try at home! That was so much fun to read and relive our experiences!